January 29, 2019, Miami Shores, Florida – On Barry University’s Miami Shores campus, an urban garden has come to fruition. It is an initiative to provide produce for neighborhoods where residents experience food insecurity. 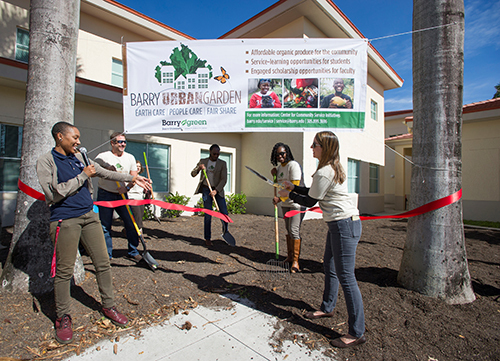 Members of the Barry University community attend the launch of the Barry Urban Garden. 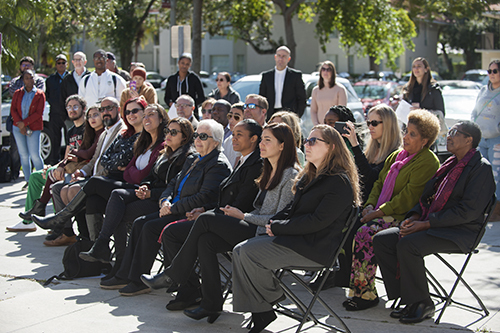 University administrators, faculty and staff members, students, and community partners gathered outside Powers Hall recently for a brief ceremony during which the Barry Urban Garden, aka the BUG, was formally launched. Barry Urban Garden student leaders are, from left, Gabriel Bouani, Barry Service Corps Fellow; Jaedyn Amaro, President of the Barry Green Team; and Paola Lopez-Hernandez, Barry Service Corps Fellow. Speaking at the event, Gerene also shared information on the annual Environmental Leadership Experience. The two-week spring program for Barry University and Siena Heights University students takes place on the Adrian Dominican Sisters Motherhouse campus. Ten Barry students participated in 2017, when the program was initiated, and eight last year. Members of the BUG Advisory Committee turned over the soil in a garden plot. Dr. John Murray, Provost, and Dr. Christopher “Kit” Starratt, Vice Provost and an Adrian Dominican Associate, were in attendance. Asha Starks, the BUG coordinator, thanked Facilities Management and Urban GreenWorks, a Barry community partner, for helping to lay the groundwork for the BUG. She also thanked service-learning faculty and students for the work they have already done. Courtney Berrien, Associate Director of the Center for Community Service Initiatives (CCSI), cut a red ribbon, officially launching the BUG.